The Dow Jones stock market index last closed at 13,992, having traded to a new intra-day bull market high of 14,022 and is well within 200 points of the all time closing high of 14,164 set on 9th October 2007 which has left many investors who have missed what amounts to a 4 year bull market asking the question whether they should buy now or not? In this 2nd of a two part series I will seek to conclude towards a detailed trend forecast for stock market for the whole of 2013 and into early 2014. The overall big picture is one of exponential inflation as a consequence of government money printing fraud and the technological human productivity boosting mega-trends brought to competitive markets around which asset price booms and busts oscillate ever higher. The, US, UK and Japan to name the biggest money printers have averted financial armageddon collapse that so many books have been written to proclaim as being imminent. This is why there has not and will not be deflation. So yes technically, and fraudulently (debasing currencies) central banks have saved the world! A controversial and bitter statement to make but it is also a true statement. Something that many analysts cannot get their heads around as they wait for financial armageddon to play out in an always imminent bear market to resume. I say to them - the data you are looking at is 4 years old ! Your stuck in a time warp that is BLIND to what central bankers have done and are flagging will continue to do until economic growth returns to trend, regardless of the inflationary consequences. An example of central bankers saving the world is the fact that the euro-zone has NOT collapsed, even bankrupt Greece is still IN the euro-zone. Even I got that one wrong! Which means that we are collectively underestimating how far central banks will go. I still believe that something has got to give in the euro-zone because the current status quo is unsustainable but which is now clearly set against central bank actions. The bottom line is central banker actions to save the world economy has its consequence in the debasement of all currencies which means ongoing INFLATION. Therefore this continues to confirm my point of view that central banks, regardless of what they state in public, have instead in practice long since abandoned inflation targeting. Now there is one big problem with that which government's and central banks have been engaged in (QE- money printing to buy bonds), and that is what lies at the end of this road which is WAR as so much of government debt will have been monetized that investors lose confidence in holding bonds, which means that the government no longer has access to foreign currency or gold to buy imports, because they can buy bonds but only foreign investors can give them currency to buy imports in exchange for bonds. This is what drives countries into war of conquests for land, wealth (gold) and resources. As an example, and contrary to most academic history books, this is what was the primary driver for Nazi Germany's wars of conquest as the German state tried to stay one step ahead of bankruptcy that demanded ever escalating grabs for territory and resources as Germany systematically stole the wealth of each country they conquered to finance the war-fare state through theft of each countries assets and through taxation. Therefore at some point, unless the money printing trends are reversed then there will be wars that will make Iraq look like a picnic. The central banks are playing the game of the self fulfilling prophecy - Inflate asset prices to inflate the economy which acts as feed back loop, which is why the stock market leads economies because stock market trends DRIVE the economy (to a degree). This also explains why the perma-crowd that concentrate on bad economic statistics are looking in the WRONG place, they need to look at the stock charts that on average are up over 100%! So the stock market is up over 100% and is TRENDING higher which is acting as self fulfilling prophecy that will feed on itself all the way to the next bubble peak as more and more realise that they are missing out on what will probably turn out to be one the greatest bull markets in history which ignites the wealth effect amongst investors and speculators. That the stock market (DJIA) is converging towards my long-standing target as of March 2011 (Stocks Stealth Bull Market Ebook) of 14,200. Which implies a high probability for an imminent significant market correction. Given that the Dow over recent days has been gyrating around the psychologically important 14k level, therefore this is an opportune time for this detailed analysis to test the depth and breadth of a probable impending stock market correction. How should investors perceive a stocks bull market? It is not how so called analysts that pump out garbage promote which is in terms of looking for the final juncture. No, the only way one is going to profit from the stocks bull market is by perceiving it in terms of buying opportunities which is that the greater the deviation from the high the greater the buying opportunity presented. Conversely the stronger the bull run underway the less of a buying opportunity presented and the greater the probability of a correction. This is contrary to the psychology of virtually everything you are exposed to by so called analysts. You may still ask when will it end ? My simple answer is the end comes when the fools who have been bearish all along turn BULLISH! The end comes when everyone is talking stocks, buying garbage stocks as they did in the run up to the dot com bubble peak. When the end comes, it will make itself known many months if not near a year in advance! In my opinion the 2nd outcome is by far the most probable as a consequence of time, i.e. the longer the sideways trend then the greater the probability for a breakout inline with the expectations born of an exponential inflationary mega-trend and dissipation of speculative interest due to perceived uncertainty inherent in the mega-trend price pattern i.e. the price pattern of the past 15 years is inherently UNSTABLE - This instability breeds STABILITY ! Because the more certain a trend is the LESS likely is it to transpire. Yes, I know, we will have to wait for Einstein's theory of relativity to be debunked at some future date, but the Universe is expanding in all directions (Big Bang origins), which suggests that we do not fully understand the nature of Gravity, what is a pulling force in our plane of existence, is a pushing force on other scales of existence. Despite a 4 year bull run, the stock market when compared to preceding bull markets is clearly not over extended, at worst this graph suggests that the Dow on an annual closing basis has at least a further 10% to run, that is as a worst case. So there is no sign on this graph for an end to the stocks stealth bull market during 2013. The near 4 year old stocks stealth bull market punches through resistance at Dow 14,000 and S&P 1500 for the first time since October 2007, with the Dow closing at 14,009 and the S&P at 1513. What happened to the final fifth ? According to the most ardent or rather vocal adherents of Elliott Wave Theory the stock market should have peaked over 3 years ago ! Sept - Oct 2009, then again peaked several times during 2010, then some more times in 2011, how many final peaks were there in 2012?, and as for January 2013? Yeah you guessed the END IS STILL ALWAYS NIGH! As Elliott Wave Theory is highly seductive in nature in that it gives analysts over confidence in future projections, therefore it is important that I share an excerpt from the March 2011 Stocks Stealth Bull Market Ebook ahead of my interpretation of the current wave patterns. There are no hard and fast rules, no tenants, no absolutes that the price must obey as per theory, because in the real world the price action is the master not theoretically what the price action should do which is why over zealot proponents of elliott wave theory have missed the whole stocks bull market, instead of which the theory is just that, a theory, so should bend or even break in the face of real time price action and not engage in the exercise of ever expanding hindsight based pattern fixing. The impulse trend elliott wave pattern chart suggests that the stock market is converging towards a 5th wave peak. Given the length of Impulse waves 1 and 3 this implies a peak between Mid March and Mid May 2013. With this trend targeting a range of Dow 14,300 to 14,500. The implications are clear that following a 5th wave peak (unless it morphs into a 7th wave extension, with elliott wave you never know until after the fact!) That the stock market looks set to have a significant correction that is likely to exceed the size of Wave 2 and wave 4 corrections, i.e. more than 1000 Points, suggesting an ultimate decline of approx 1,500 off of the Peak. So a 14,500 peak would imply 13000. Zooming in implies we are in sub impulse wave 3 that should end imminently. 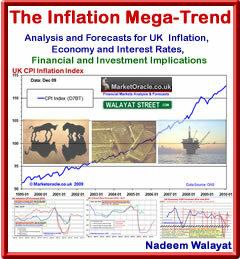 However the more important implication is for a bullish trend towards 14,300 to 14,500 by Mid to late March 2013. Zooming way out of the chart shows that our five wave pattern is actually part of a larger 5 wave pattern that is also set to terminate, i.e. a 5th of a 5th. This acts to increase the order of magnitude for the subsequent correction for now it implies that this years stock market high will subsequently seek to correct the whole bull market trend from the March 2009 low. Again using the size of Wave 2 and Wave 4 as a minimum guide this suggests a decline of at least 2,000 points during a multi-month correction. In reality the implied correction could extend as far as 3000 points, i.e. to just below Impulse 2. Elliott Wave Conclusion - The wave patterns appear pretty clear in that they do portent for a significant stock market correction this year on termination of the current rally that will at the very least retrace the WHOLE of the current rally, that's back down to BELOW 12,500 and probably extend to below 12,000. Now don't take this as a forecast because it is way beyond what probability analysis can ever give confidence to, instead treat it as an indication that whilst stocks into mid year may look sickly in the broader context the move would be very healthy by setting the stage for the stocks bull market's next multi-year bull run. Remember that the over-riding driver is the Inflation mega-trend to which stocks are leveraged, and the risk that the world constantly faces is not one of deflation but one of out of control inflation both as a consequence of rampant government money printing and as a consequences of any breakdown in our systems. For instance the crisis in Greece contrary to the economic academics did not result in deflation, instead it resulted in Inflation, because economic collapse results in the destruction of productive capacity, which results in the state forced to print money to pay the increasing number of unemployed workers. Market sentiment is usually in synch with the mainstream media, which at this point in time should suggest that it should be at its most bullish in the face of the ongoing swing towards NEW All Time highs for indices such as the Dow. The psychological influences that investors tend to be exposed to is illustrated by how so called analysts tend to commentate on market trends which tends to be bearish AFTER the market has already fallen and Bullish AFTER the market has risen. i.e. many of the commentators who are so bullish today could easily be found to have been vehemently bearish towards the END of virtually every major correction for the duration of this stocks bull market. So without analysing the analysts, I am pretty certain that after leaving the perma-bears aside that investor sentiment will be at a bullish extreme, which requires a contrary trend to dissipate such sentiment. In terms forecasting trend, this suggests that the market has been in the process of hooking more investors towards the extremity of price action before it pulls the rug from under their feet. Technically this implies the market is priming itself for an opportune moment for a significant correction. which implies risk management is in order i.e. distribute portfolios further into this rally or hedge (my preference is for hedging because, in my opinion dividend income is the most important long-term driver for both income and stock price growth). In terms of the big picture the stocks stealth bull market will continue to accumulate more and more investors towards rally peaks as rising stock prices results in ever increasing investor sentiment which will confound the perma-bears who will always see high investor sentiment as a sign of the FINAL TOP, but what they are blind to is the fact that NEW HIGHs WILL Mean NEW Higher levels of Investor sentiment, which to them will always be a sign of extremes, but in reality it is just a manifestation of TREND. The bull market is not an oscillator it is a Trend that is converging towards a state of extreme over valuation, which is when the actual top will take place, when? I will let you know when probably a year in advance, but not likely in 2013. Recent stock market volatility has been nudging multi-year lows that implies a great deal of investor complacency out there. The VIX coupled with the actual immediate trend is clearly distributive as it can be directly compared against the Sept-Oct distribution that was accompanied with rising volatility from the Mid Sept low. This does suggest that a correction is imminent and given extremely low volatility the correction will likely be very significant in both time and price. Another point to consider low volatility translates into cheap options! MACD - Just as the VIX is has been at multi-year lows so has the MACD been at multi-year highs. The MACD has already crossed which is an advance sell signal. Therefore the MACD is clearly warning of at least an imminent regular Impulse correction. Price Patterns - Apart from the broadening top pattern that I have already covered earlier. I do not see any thing else of any significance. The current trend is contrary to the seasonal tendency for the stock market to fall from early January into mid March, which suggests an inverse probability i.e. a rise into Mid March would imply a fall into Mid May, before a volatile summer resets the seasonal pattern back inline for expectations for a rally during the last 2-3 months of the year. The smoothed trend for the stock market would be for a rally into early June, sideways into Mid October and then a rally into year end. This at least points towards an end year rally, whilst probability favours an inverse pattern into a Mid May low and then another low between August and October. TREND ANALYSIS - The current rally has hit or even marginally breached the resistance line along the highs. This is putting the rally under intense pressure that warrants an imminent correction of sorts to dissipate this trend pressure. Whilst upside appears limited the stock market has plenty of support under it that is more than capable of slowing a decent which implies a very choppy correction is likely with major support converging at 12,800 by mid April. In summary the Dow is trading in a strong upward sloping trend channel that is likely to contain 90% of the price action during the year. SUPPORT / RESISTANCE - Resistance lies at the all time high of 14,164 that it hit on 9th Oct 2007, that is on par with my long-term target of 14,200. Therefore the Dow IS now at Significant resistance that requires a sizeable correction to overcome. A String of support levels range all the way to 12,500, which if fails would target 12,000. PRICE TARGETS - The immediate target is a high in the range of 14,100 to 14,200. The Dow has already traded to 14,022, so a high is imminent. A correction targets 13,600, then 13,000, then 12,500 and finally 12,000. The stocks bull market is not showing any signs of ending during 2013. That the stock market is targeting to trade at a new all time high this year. The stock market is expected to under go a severe correction that is most probably timed to reach its juncture late Summer. The stock market can expect to trend towards a new bull market high by year end / early 2014. That the rally following the significant correction needs more time to complete, i.e. the 14,500 target is achieved later during 2014. If you have actually read the whole of this analysis (rather than just skipping to the conclusion) then the message you will get is one of an ongoing stocks bull market that like a coiled spring is prepping itself to propel the stock market to levels that cannot be imagined today I.e. my Elliott Wave and broadening top analysis gives strong indications for longer-term expectations. I can easily see the Dow trade at 20,000 during 2017, so expect plenty more Stocks Stealth Bull Market ebook's to follow. The NEW soon to be released Ebook (FREE DOWNLOAD) will contain additional material on stock sectors investing, risk management and trading. Ensure you are subscribed to my always free newsletter for the FREE DOWNLOAD. 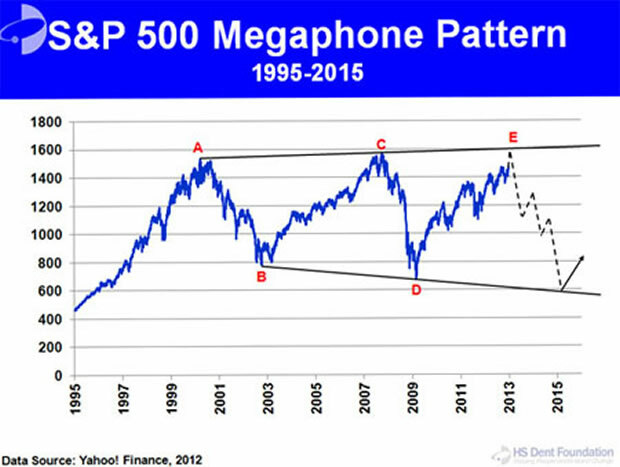 Your the trend is your friend analyst reminding you of where the bull market began.... Stealth Bull Market Follows Stocks Bear Market Bottom at Dow 6,470... The stock market is now up 116%.